Dr. Hauschka Hydrating Cream Mask comforts the skin, sustainably preventing it from drying out and protecting it against external irritants. The composition with quince and rose activates the skin’s hydrating properties and regulates its sebum and hydration processes. Precious almond, avocado and jojoba oils noticeably pamper and protect the skin. Hydrating Cream Mask is the ideal complementary intensive skin care product for dry, sensitive or tired skin, as well as skin that has been stressed by environmental influences. The skin feels soft and looks fresh and smooth. This is hands down the BEST skin care products I've ever used. It pumps up the skin and eliminates my droopy eyelids. My skin absolutely glows. The result is that my 60 year old face appears decades younger. Highly recommended!! After microdermabrasion my combination skin had dry patches and felt tight. 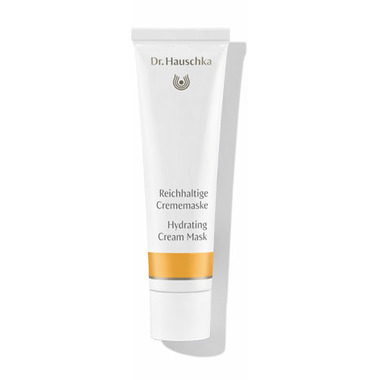 The Hydrating Cream Mask together with dr. Hauschka's Soothing Mask really does the trick. The redness is gone and my skin is soft. It is also great after being outside in harsh wind and cold.